The AFS Intercultural Link Learning Programme helps our volunteers and staff improve their intercultural skills, teaches them about key education theories and practices, and makes them better able to support the learning of others. To be able to support students and host families on their intercultural learning journeys, AFS volunteers and staff must know the basics of intercultural learning and the educational benefits of the AFS experience. With this in mind, AFS has the Intercultural Link Learning Programme – the official network-wide training and assessment programme on Intercultural Learning. The Intercultural Link Learning Programme (Learning Programme) is intended for volunteers and staff to become more interculturally sensitive and to develop the abilities needed to facilitate intercultural learning in others (students, schools, host families, and people external to AFS). As something used around the AFS world, it also gives a shared vocabulary to volunteers and staff whether they are in China or Ghana, Canada or Germany. In short, using a variety of interactive and reflective methods, the Learning Program helps volunteers and staff develop the knowledge, skills and attitudes needed when interacting with people from other cultural backgrounds, inside and outside of AFS. Topics in the Learning Programme include: the AFS educational approach, definitions and concepts of culture, the difference between generalisations and stereotypes, intercultural communication, cultural values and dimensions, intercultural conflict styles and management, and cultural adaptation. The Learning Program also introduces useful tools and models to help volunteers and staff suspend judgement in intercultural settings and to identify ways to help others become more intercultural sensitive. 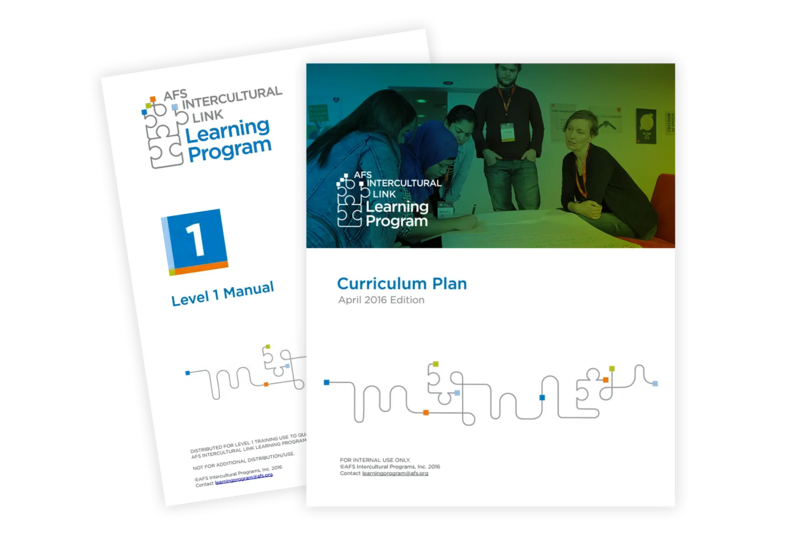 The AFS Intercultural Link Learning Program offers four learning levels, each building on the other to help volunteers and staff achieve the core competencies. The introduction course to the Learning Programme, What Every AFSer Should Know about Intercultural Learning™ 2.0 (known as “Level W”), is mandatory for all volunteers and staff around the AFS Network. In Level W, participants learn the fundamentals of the AFS Educational Approach, models of culture, cultural values and dimensions, communication styles, cultural adaptation and the AFS Educational Methodology. Expanding on the essentials of Level W, Level 1 participants explore a deeper understanding of the concepts of culture and different models to explore cultural communication and adaptation. They participate in an intercultural simulation and group work to analyse case studies and develop constructive interventions or strategies to deal with intercultural conflict. Level 2 provides a deeper understanding of how to navigate intercultural conflict, as well as how to help AFS students become more interculturally sensitive. Like Level 1, Level 2 also takes part in a simulation activity as well as group work, where participants develop orientation activities that correspond to the AFS Educational Goals for Students and the AFS Student Learning Journey. Level 3 introduces intercultural problem solving and decision-making, giving and receiving feedback, and the complexity of power and privilege in intercultural settings. Participants are invited to take the Intercultural Development Inventory (IDI) assessment before they start the workshop. Participants work to create Personal Development Plans (PDPs) which highlight the ways in which they intend to be effective interculturalists and leaders in the immediate to near future.